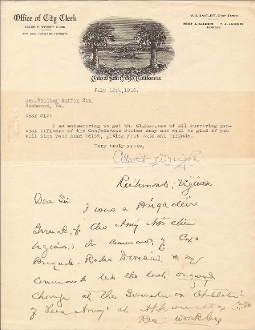 Autograph Letter Signed, 1 page, 4to., City of San Diego, California, July 15th, 1915 from the Office of the City Clerk requesting information. I was a Brigadier General of the Army Northern Virginia, in command of Cox Brigade, Rodes Division. My command led the last organized charge at the Surrender and capitulation of Lee's Army at Appomattox C.H. Res. Wm.R.Cox"
Slight aging, otherwise very fine.